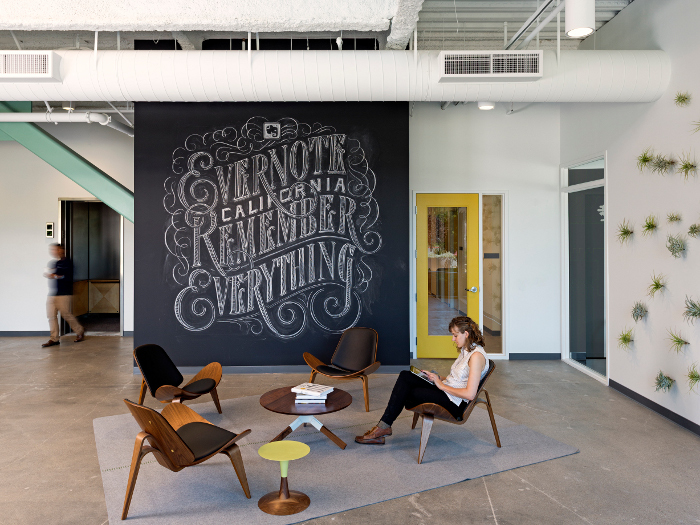 Creative app company Evernote, known for creating digital message note apps and pushnotified reminders enlisted Studio O+A to design its California offices. With only seven months and a limited budget, Studio O+A created the office space with one design philosophy in mind: through clean and modern design, cheaper materials take on the impact of richer finishes. In accordance with this philosophy the coffee bar and break areas are clad with fir plywood. While this is an inexpensive wood, the grain creates its own graphic pattern, adding decoration, and the cladding is complementary to the offices' informal and bright style. O+A used a mix of white walls, blonde woods, and pastel accents to enhance the natural lighting of the spaces. 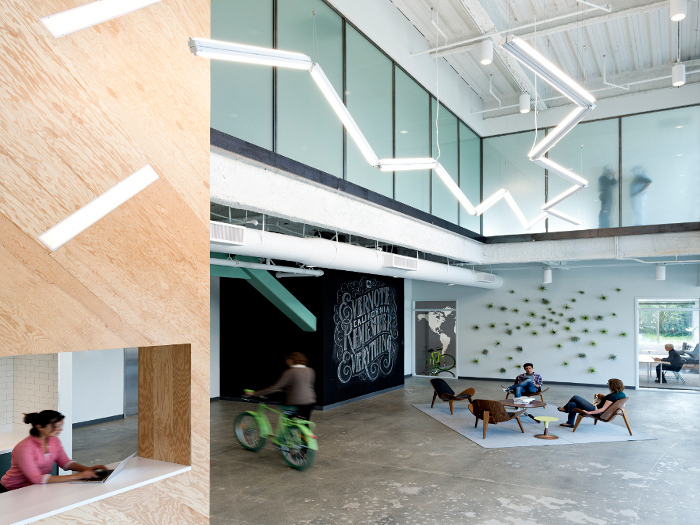 Fluorescent strip lights brightly illuminate the space where workers can casually meet - something encouraged by Evernote. Arranging the strips in lightning-bolt shapes creates a modern aesthetic that enhances the otherwise plain and economical product, combining the basic industrial elements with dynamic design. 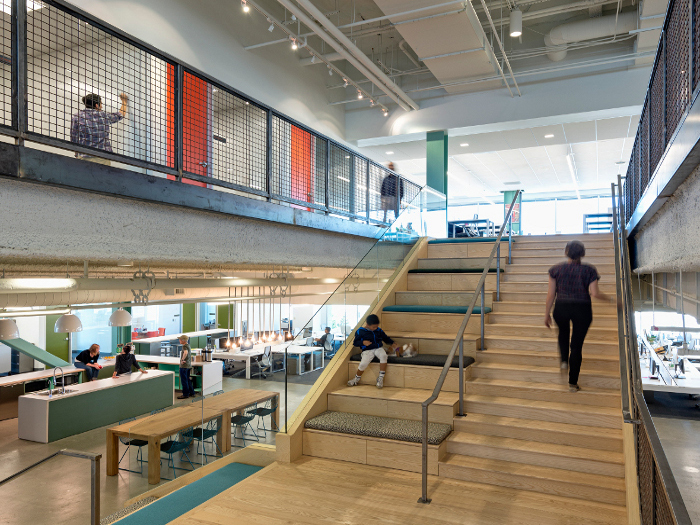 Continuing with the company's casual-meeting mantra, a white-ash stairway that connects the fourth and fifth floors have cushioned seating embedded into the treads - creating another gathering space for informal meetings. And to help promote workforce creativity all of the walls along the core of the building are covered in whiteboard paint, encouraging employees to grab a pen and scribble down their ideas, no matter where they are in the office space. O+A even squeezed in some economy artwork, using chalkboard spreads across the wall of one of the many breakout areas to feature work by chalk artist Dana Tanamachi. Tanamachi's work is a representation of the company motto: 'Remember Everything', providing a cost-effective installation of brand identity. With the company logo demonstrated as an origami elephant's head in one of the conference rooms, other unusual ornamentation are not uncommon in the workspace. One wall is adorned with air plants spreading into the shape of an exploding firework, with the greenery offering an organic contrast to the clean design. The creativity and resourcefulness of Studio O+A's design lies in happy partnership with Evernote's creative workforce, proving, if proof is needed, that time and budget restrictions do not have to restrict the imagination.